Arranged & adapted by Pat, Tom and Liam Clancy, unless otherwise noted. Apparently, this is the only Audio Fidelity by the Clancys to released digitally. Welcome to our house — if you can find it — whether you've come to visit us before in a concert hall, a club or a pub, whether we've been to your house — on record or telly — or even if you don't know us from a hole in the ground. And if you don't we are Paddy, Tom, Bobby and Liam Clancy, from a small town in Ireland to which we ramble back a lot and then ramble off a lot again. We set out from there young, one by one to seek our fortune. One of us might have tried to sell you insurance, floor polish, or an encyclopedia — maybe welded the harvester together that you've got on the farm or painted your house. Could even have played Shakespeare to you on your cultural night out. You might have met one of us in a tent in India or on a farm in New England, guzzled beer with us at the six o'clock swill in Australia or sipped something stronger sitting in a cafe looking out over the Mediterranean. Paddy or Tom might have been your R.A.F. buddy as a raw recruit at the end of the war in England or you might have whistled after girls with Bobby on a street in Athens or the Middle East — maybe I collected songs or tales from you in the Appalachian mountains. It could be too we met on the unemployment line. Home has been a lot of places, work has been a lot of things. But mostly for us work has been the fun of singing. So let us poke some fun at you, or try to reform you or make you sad with a few songs at our house — wherever it is. This was the first non-Columbia release for the Boys in almost a decade. Their Columbia contract expired, they struck a deal with Audio Fidelity Records, which was the label that originated stereophonic albums and stereo sound in 1957 and was best known for its specialty albums (i.e. belly dancing music, sound effects and the like). The album was recorded in London and the musical arrangements were influenced greatly by Steve Benbow, an English folk artist who also was involved in Christy Moore's infamous debut LP, "Paddy on the Road", but that's another story. Had it not been for Teo Macero's penchant for string orchestration on "Flowers in the Valley," Benbow's arrangements would seem a somewhat over-produced when compared to other Clancy releases. Eddie and Finbar Furey are also not featured on this album. The album cover is the first non-Tradition release to not feature the aran sweaters. In an effort to garner a hit single, a Shel Silverstein song, "You're Always Welcome to Our House" served as the lead track and a 45 single release. The Irish Rovers had recently had a major hit with another Silverstein song, "The Unicorn", which has caused that song, for better or worse, to be almost universally considered an Irish song, although Silverstein was a Jewish author/artist from Chicago. 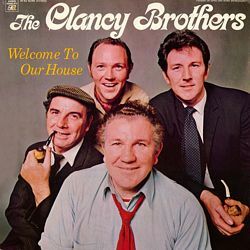 The world of Irish music would have been better served if "You're Always Welcome to Our House" had become a hit. The song has a dark humorous quality that is very Irish in nature (i.e. "Weila Walla"), which would make for easier assimilation into the Irish music lexicon. Another great plus is that this song doesn't have hand motions. Often overlooked, the version of "The Limerick Rake" is the best I have heard. The same goes for the Australian song, "Overlanders." The first three songs are all great, but then the album hits a wall with a song that can best be placed in the "What on earth were they thinking" category. "The Poor Young Man", sung solo by Paddy, is so bad, words cannot properly describe. You just have to hear it for yourself. This is followed by a lightweight forgettable song, "The Card Song," sung by Bobby (although, I will grant that a live version of this song sung with Louis Killen in 1971, which featured the group alternating the verses took the tediousness out of the song and made it quite enjoyable). Side two opens with "Beer Galore," which is good song. Liam's solo on Ewan MacColl's "Sweet Thames" follows and again this is one of the best versions of that song done by anybody. A great version of "The Foggy Dew" is next, but it is labeled "Down the Glen" on the album itself (for the 1970 tour program, the advertisement for the album lists it as "The Foggy Dew" — thus, it is evident that the Boys knew the correct title of the song). The incorrect title is most likely due to some sort of provision in their Columbia contract that forbade them from releasing alternate versions of songs that they had previously recorded for Columbia for a specified number of years (a very common provision, by the way). At least this way, they were able to make it less obvious and disguise it somewhat. The track was too good not to release. Then, once again, we hit the wall with "Lolly Too Dum," which just isn't that good. Tommy Makem recorded this as well for his 1971 LP, "Love is Lord of All" and it is one of the weaker contributions to that release. "Welcome to Our House" closes with Gene Raskin's "Café by the Sea," which is great, and "Time Gentlemen Time." The latter song was the b-side to the 45 single release and features Tom as the soloist. There's some really great material on this album. Unfortunately, there are three clunkers here that significantly mar an otherwise great album. This LP is not available on CD, nor are any of its individual tracks.